To jump start the 2010 Holiday Season, we are going to run a weekly product promotion all the way through January 1, 2011. You will be able to SAVE 15% on a different product or set each week. The feature product for the week of October 25 – October 31st is the Xtrema 5 Piece Basic Set. The Promo Code to enter will be (xweek15) which will allow you to save 15% on that specific product. This promo will only be good for the week so don’t hesitate to purchase if the Xtrema 5 Piece Basic Set sparks your cooking interest!! 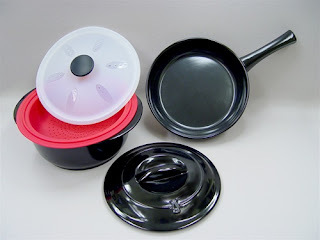 The Xtrema 5 Piece Basic Set includes; 8″ Skillet, 2.5 Qt Saucepot with Cover and 2.5Qt Silicone Steamer Basket with Cover. Remember to use the Promo Code (xweek15) to save 15% on the 5 Piece Basic Set! !